If you have Apple devices already, then the Apple TV might be the best $69 accessory you can add. We like to recommend them on every job we work on. They are low cost enough to be an impulse add on, and they end up being one of the most loved and used parts of any TV setup. We've found that many people don't know what the Apple TV can actually do, so this is a bit of an educational post. I'm going to go over most of the features. Some in more detail, some in less. Feel free to ask for more detail on any specific feature below in the comments. The first thing I'm going to say is that the Apple TV is not actually a TV. No, it's not a $69 TV made by Apple. If and when apple ever makes a TV is another subject and a very debatable one at that. The Apple TV is a small device that you connect to your tv, similar to how you would connect a DVD player to your tv if DVD players were still relevant. The Apple TV is regarded as a hobby by Apple, in other words, its a low volume product that they dont really need to make, but think its interesting enough to keep around. Over the years, they slowly add new features and apps enhancing its capabilities. This is a feature list of what the apple tv can do, of which ill explain more below. iTunes - Rent or buy movies, buy TV Shows, Stream music from your music match itunes account. If you buy a movie or tv show on your apple tv, it will be available on all your other apple devices magically through the cloud. Buy once, watch everywhere. The disc is dead. Media Streamer - Any media on your home computers, ipads or iphones can be streamed to your Apple TV via Home Sharing or Airplay. Click here for a little 'How To'. Photos - Stream them from your iPhone or any other apple device, or better yet set up your apple tv to receive your iCloud photo stream. Meaning if you take a photo on your iphone, it will be available on your apple tv, without you doing a thing. That means awesome slide shows, or screen savers displayed beautifully on your TV. Apps - HBO, Showtime, Netflix, Hulu, NBA, NHL, MLB, YouTube, Flickr, Vimeo, Wall Street Journal, and more. Apple has been adding apps quietly over time, and they even changed the design layout recently to look more like iOS. They even let you arrange apps on the apple tv very similar to how you would on your iPhone. Hopefully they not only add new better apps over time, but eventually create an app store for it. Airplay Mirroring - This is where it gets interesting. 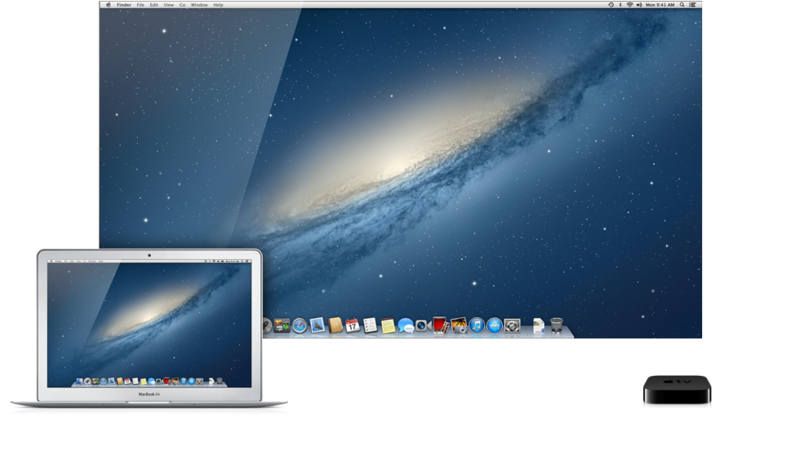 You can mirror your display from your mac, ipad, or iphone directly on to your apple tv. Meaning that whatever you see on your ipad, you will see on your tv. That means, safari, mail, games, movies, whatever. Same goes for your macbook. Exact mirror display. Amazing for presentations, or better yet... gaming. Click here for a little 'How To'. Gaming Console - Ok, so its not really a gamin console in the traditional sense, but it has huge potential to be one. Apple is already disrupting the gaming industry with the iPod touch, iPhone, and iPad. The way games can be purchased as such reasonable prices, , downloaded and played instantly is really having a big affect on how other companies like nintendo and microsoft are approaching gaming. By using Airplay Mirroring, you can play that great game on your iphone / ipad right on your TV. Where this gets really cool though is when game developers take advantage of this technology. Certain games, when mirroring, give you an exact mirror of your game on your TV. While thats cool, other games are taking it to the next level. Games like Real Racing 2 HD do an amazing job at airplay gaming. With that game, when you turn on airplay, your iPad or iPhone turns in to a race track map showing your position, while the TV shows your car racing around the track. Upping the anti even more, they will let you play multi player on your TV against other devices in your home allowing you to play 4 player split screen. Imagine, you and your friends holding iPhones or similar devices and using them as controllers, while the game streams through your Apple TV on to your big screen. That might be the future of gaming, and Nintendo must have recognized this as they borrowed the concept heavily for their recent Wii U.